Mainz - Bayer 04 Leverkusen bounced back from their midweek UEFA Champions League defeat to record a comfortable 4-1 win over 1. FSV Mainz 05 at the Coface Arena. 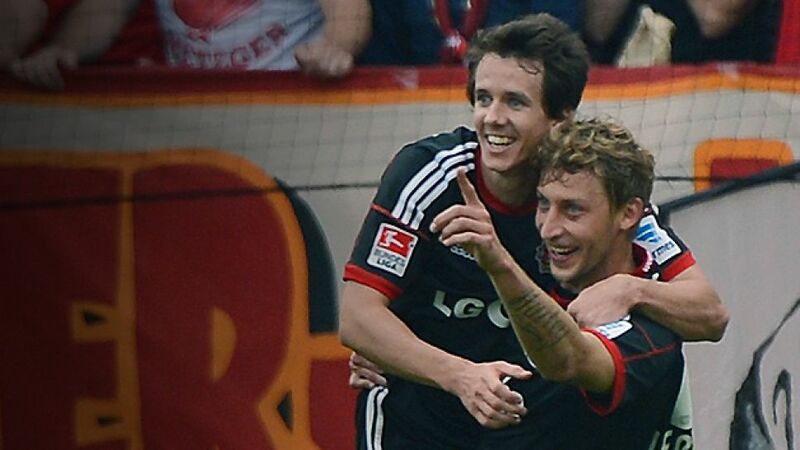 Robbie Kruse put the Werkself ahead, before Lars Bender’s deflected effort doubled Leverkusen’s advantage. Kruse made it three for the visitors on half-time and Stefan Kießling grabbed his fifth of the season to extend the visitors’ lead. Yunus Malli pulled one back for Mainz, but it wasn't enough to ruin a great day for the guests. Leverkusen, who had lost 4-2 to Manchester United FC in the Champions League on Tuesday, started brightly against die Nullfünfer, evidently keen to put their midweek disappointment behind them. Captain Simon Rolfes, who scored in the defeat at Old Trafford, came close to breaking the deadlock after ten minutes when he got on the end of Sidney Sam’s cut-back, but his effort flew just over. Maxim Choupo-Moting went close for Mainz with an effort from distance, but it was the visitors who took a deserved lead after 20 minutes. Sam won possession in midfield, before releasing Kruse with a pinpoint pass. The Australian kept his composure to calmly slot past Heinz Müller and inside the near post. Bender then nearly doubled the visitors’ lead with a terrific effort from 20 yards out, but his shot could only find the side-netting. Sami Hyypiä’s side doubled their lead in fortuitous circumstances seven minutes before half-time. Bender again was given time to let fly from distance, but his shot took a huge deflection off centre-back Nikolce Noveski to wrong-foot Müller and extend Leverkusen’s advantage. The same player then almost grabbed his second of the game five minutes later but this time Müller was able to tip his strike on to the crossbar. It was Kruse who did double his tally for the afternoon right on half-time. Sam laid the ball off to Rolfes, who could have gone for goal himself. The 31-year-old instead opted to set up Kruse, who had time to take a touch before firing into the far corner of Müller’s goal and give Leverkusen a comfortable 3-0 lead going into the break. Unwilling to rest on their laurels, the visitors continued to press forward after the restart and made it 4-0 just before the hour mark. Zdenek Pospech could only clear Roberto Hilbert’s cross as far as Rolfes on the left-hand side and when the skipper picked out Kießling at the far post, the forward headed home his fifth of the campaign. Mainz did pull one back with seven minutes left. Leverkusen failed to clear a corner, giving Malli the opportunity to pull the trigger from the edge of the box and this time, it was Bernd Leno who was beaten by a wicked deflection. The goal was no more than a consolation, however, and Leverkusen held on to seal an impressive victory, their fifth in six games this season.